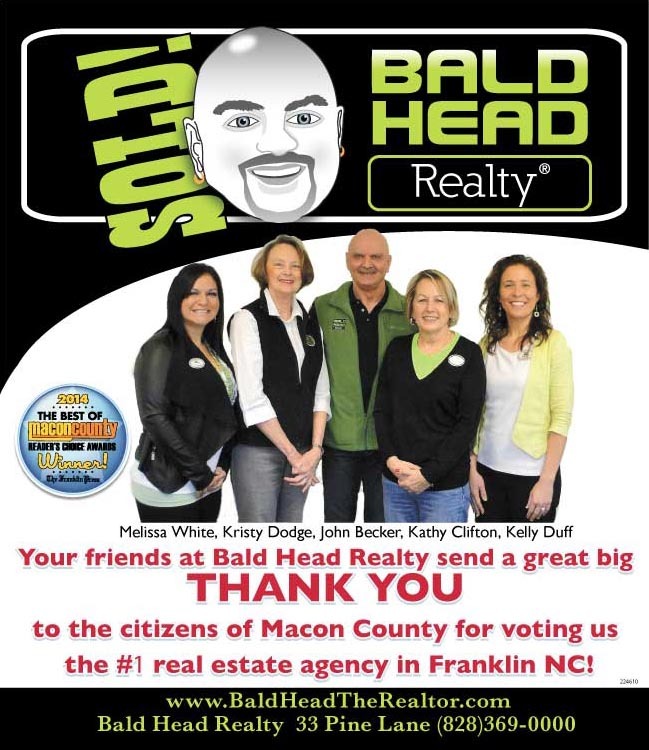 Franklin and Otto NC Real Estate Listing Solutions offered by Kathy Clifton - Your Local Realtor. A mountain home with the ultimate WOW factor – it will impress the most discerning buyer. 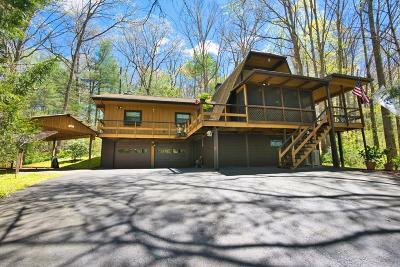 Huge decks to enjoy amazing views, expansive T&G vaulted ceilings, luxury master suite on main level. Upper level features loft, library, bedroom, bath AND a lower level offers a full in-law or guest suite with private entrance. Gorgeous exterior stonework. This is a must-see. It’s the perfect private mountain estate. The sunset views from the huge three-season porch will astound you! The mountain views go on forever. You’d never guess you were just one mile from downtown Franklin! Easy living on one level with a lower level guest suite. For the men…a wonderful 30’ x 20’ workshop with tall ceilings, garage door and workbench. Many nice updates to this home over the years – See it to appreciate it! Welcome home to the Peace and Tranquility you'll find with this End of the Road paradise. From the welcoming entrance lined with easy to care for perennials, to the impeccably maintained home, this one is a winner in anyone's book. Open floor plan,T & G vaulted ceiling, distressed hickory floors, updated kitchen and master bath. Lower level has family room, guest bedroom and bath. Double covered porches and low maintenance yard, no grass to mow. Beautiful home in private setting..don't miss seeing this one! Fish, play and relax while enjoying the sweet sounds of rushing..and I do mean...rushing Ellijay Creek! The waterfall and creek run the entire length of this property. Two bedroom, two bath home has a big master suite with walk in closet and the bath has a whirlpool tub and separate shower. Upper level has two bedrooms, office space and full bath. Lower level has a one car oversized garage and a separate workshop space. 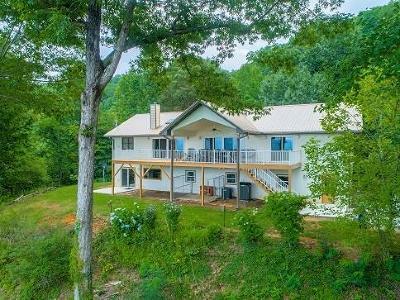 Amazing property with over 1300 feet of Little TN River frontage and a nice mix of pasture, wooded areas and cleared land along the river plus mountain views! House has spacious rooms with country kitchen, sunny dining room with lots of windows, master suite with private porch and much more. Greenhouse, workshop, old barn, smokehouse, and a guest cottage with one bedroom and private deck. You have to see this one! Amazing 30 mile views from this Luxury Heritage Log home. 6200+ SF of unprecedented details. Large master suite, bath has glass block walk in shower, beautiful kitchen with granite counters and hickory cabinets with pullouts. This house has a guest area, den, studio/gallery area, office, game and media room and more. You have to see this one! The mountain lodge at its very best. With unbelievable views, this 4,000+ square foot beauty has 3 levels with 5 bedrooms and 4 baths. Great upper level with 2 loft areas and connecting open walkway. 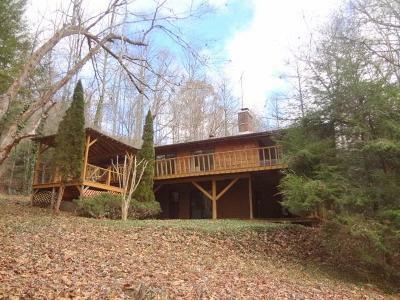 2-Story stack stone fireplace, wraparound porches and open deck with hot tub. Workshop with full bath at bottom of property. Watch the video and call me to see this property. There are not many like it. Rich in character and loaded with tradition! This amazing log home is still owned by the original family. 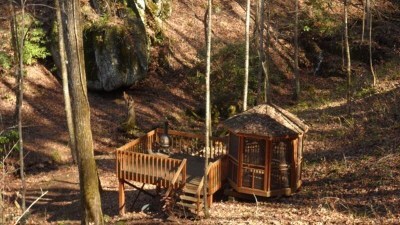 Extensive covered porches to enjoy the view and listen to the roaring creek down below. Two rock hearths with wood burning stoves in the living and dining rooms, plus central H&A. All rooms are big. Vaulted ceiling in the living room and master bedroom. Partial basement with workshop, sink, one car garage. 2nd parcel with cleared off building site. Once in a lifetime opportunity. Furniture negotiable. Creek borders this property and it is loud! Swain Counties. Only 3 property owners on Kudzu Corners, all with large tracts. Awesome long range mountain views from a spacious 40.8'x8' covered porch. This area is noted for its beauty and serenity. It's surrounded by nature on all sides. rock fireplace with gas logs. 5-Star Chef's gourmet kitchen with EVERYTHING! can hardly describe this one. It's paradise found. You will want to see it in person. long-range mountain and pastoral views. Enjoy them from a 48' covered porch! system. This is definitely one to see! a mountain home should be. home that "has it all". This is a must-see video. and covered porch on the third. Beautiful peaceful setting. You will love this. Ellijay Creek from a spacious screened porch. Many updates and FURNISHED! Beautiful low-maintenance yard featuring gorgeous perennials and blueberry bushes. 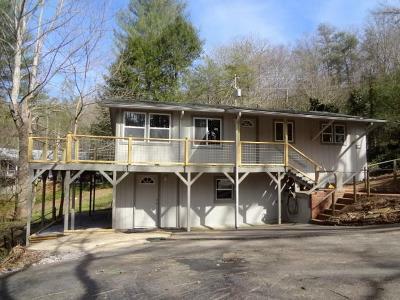 Great lower level with full bath and 3 bonus rooms. This is one to see. Tennessee river frontage. Tube, raft and kayak from your own property! Also bordered by a stream. Log-sided home with great screen porches. This landscaping is right out of Southern Living Magazine! Beautiful raised vegetable and perennial gardens. Big open floor plan with vaulted ceiling and wood beams. Great outdoor spaces with 3-season porch, open deck and screen room. A true mountain showplace! You will want to see this one. porch for outdoor living. A must-watch video. BIG mountain views from this awesome custom built log home. This 5 bedroom-4 bath beauty features wood floors and ceilings, laurel railings. Open floor plan with huge master suite and sitting area. Amazing outdoor living space with wrap-around porches and decks. Home has been a very successful vacation rental. Gorgeous furnishings are negotiable - Owner is ready to deal! This is a must see. One Word - WOW! 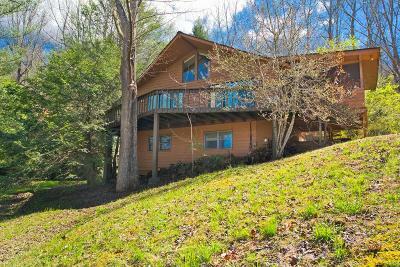 Set on 4+ private acres with amazing views from huge covered porches and decks. Great family space with 2 bedrooms on main, 2 bedrooms on upper level and 2 bonus rooms. Gourmet kitchen, master suite with its own deck and extensive high end finishes. Bring offers - Owners are ready to deal! Beautiful setting - flat yard - BIG views. End of road privacy and unrestricted. a call to see it in person. This is one you don't want to miss! floors throughout. Kitchen features gorgeous maple cabinets. Outstanding quality-built home in prestigious Mill Creek Country Club. Open floor plan with massive vaulted tongue & groove ceilings in kitchen, living and dining areas. Beautiful long range views from covered porch and decks. Terrace level is a one-bedroom inlaw or guest suite. Must be seen to be truly appreciated. Craftsman style home with custom features second to none. Two main level living areas and fully finished lower level easily converted to third bedroom. Big windows bring in abundant natural light. Interior features vaulted ceilings, newly renovated kitchen and fireplaces in family and living areas. Beautiful, mature landscaped property. See this one in person! The epitome of mountain living - Log-sided cabin with wood walls and floors, complete with rushing creek. Room for family and friends, wonderful setting with views and privacy. Has a very successful vacation rental history. A must-see video to appreciate this cabin. Gorgeous mountain chalet with views galore. Privacy assured with 0ver 400 feet of the property adjoining U.S. Forest Service land. You'll hear the creek in the background of this video! Great deck areas to enjoy the views. Soaring vaulted tongue and groove ceiling - Kitchen features granite counters. You need to spend a few minutes seeing this one! Unbelievable Views! Bring the outdoors in with a huge 3-season porch and separate screened porch. Open Floor Plan, Complete in-law suite. Gorgeous landscaping. Many interior and exterior updates. This is one that must be seen to get the full effect. It's a great time to buy! Prices low, interest rates still low. 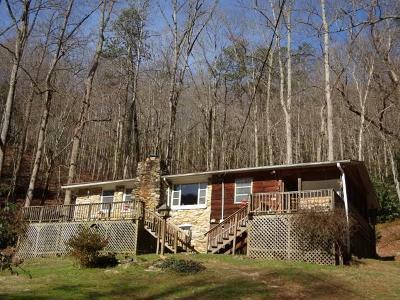 Check out the market conditions in the beautiful mountain area of Franklin, North Carolina. 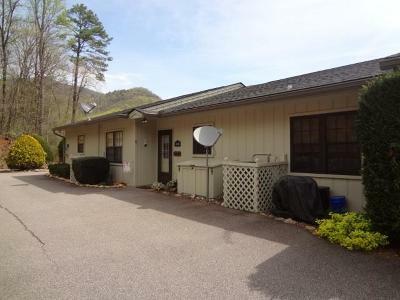 Meticulously maintained one-level living with two covered porches to enjoy the long-range mountain views. Updated and totally move-in ready. A HUGE unfinished basement can be customized to your liking. Gorgeous easy-to-maintain landscaping. Furniture is negotiable. Pack your suitcases! In-town living at its finest. Totally updated inside and out - Truly move-in ready. Cul-de-sac lot with great backyard privacy. Wonderful double covered porches. You will want to take a closer look at this one. Gorgeous property with 3 outbuildings, rushing creek, perennials and fruit trees. Impeccably maintained with hardwood floors and a large sunroom with vaulted ceiling. 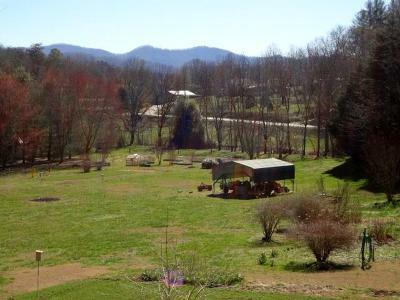 Gentleman's Farm on almost 5 acres with 5 outbuildings and long range views of Albert Mountain. Beautiful hardwood floors throughout. A one-of-a-kind property. Pure paradise. Fish, kayak, raft and hunt in the peaceful, tranquil Needmore area with 1000's of acres of National Forest within a stones throw. The Little TN River just 1/2 mile away. Original owners have maintained this home and property beautifully. One level living with vaulted T&G ceilings, rock fireplace, Red Oak mantle and bookshelves handmade by the owner from trees on this property. Small waterfall and stream. Birch hardwood floors, double covered porches & screen porch. Kitchen with Corian counters, tile flooring & backsplash. Partially finished lower level with HUGE workshop, full bath, living/sleeping area and storage. Energy efficient home with reports to prove it. Wired for generator and has water filter/softening system. Relaxing firepit to enjoy Smores with your family. Once in a lifetime opportunity. Current Market Conditions in Franklin, NC? In a Word.....GREAT! Your Full-Time, All the Time, Every Time Agents! First class log-sided beauty that's fully furnished. Exceptional quality with oak floors, tongue and groove walls and soaring ceiling. Exquisite floor to ceiling stacked stone fireplace. Spacious lower level that could be used as a 4th bedroom. Oh Yes, a great hot tub! And more! 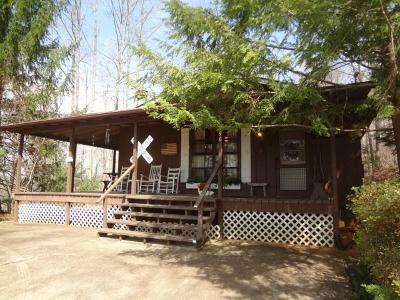 2-Bedroom, 1 Bath guest cottage with a lucrative vacation rental history. This is a video to watch 2 or 3 times to get the full effect. Gorgeous pastoral setting with bordering stream. One-level living at its finest in the upscale Brookstone Vista development. 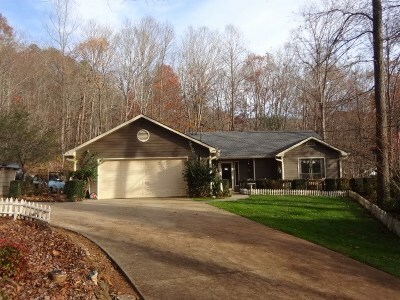 Covered porch and open deck; great open floor plan with vaulted ceilings and hardwood floors. You will love this one! 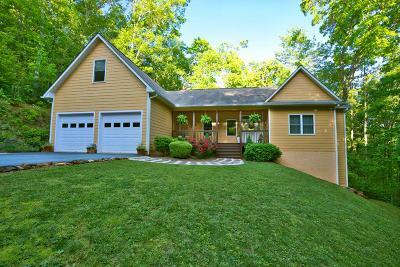 Impeccably maintained beauty with three covered porches. Interior features open floor plan with hardwood floors. Terrace level offers family room, office, full bath, workshop and storage areas. You will want to see this one. Absolutely gorgeous BIG CREEK property. 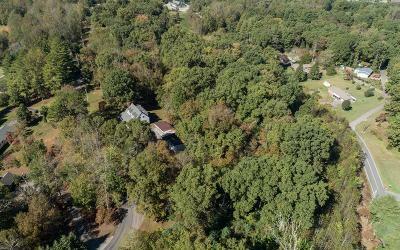 Over 6 acres with hundreds of feet of creek frontage. Open floor plan, hardwood floors - A true mountain luxury home. Great curb appeal with privacy and convenience. Lush, easy maintenance yard. Enjoy the video! One Word - WOW. Craftsmanship second to none. Gorgeous private setting, yet not remote. Epitome of a mountain getaway. Listen to the stream from your open deck or covered porch. Awesome long-range views! You will love this one! Great curb appeal - Spotless inside and out. Onve-level living with open floor plan. Huge kitchen, hickory floors, wonderful screened porch to enjoy the outside. Unbelievable Gentleman's Farm with 2 barns, 10+ AC of pasture. Property features 900' of creek frontage and a gorgeous pond. One-Level living with an open floor plan. Peaceful and private setting. Not to be missed. The true epitome of a mountain home, this beauty has it all. You'll fall in love with this home as you enjoy the video. Beautiful 9.67 Acre property features fast-flowing Jackson Creek and partially-built Craftsman Style log home. Owner would finish for new owner. Very private setting with end-of-the-road privacy. Stunning New Home on a Private 3.46 Acre Paradise with Access to Lake Emory. A Must-See Video. Enjoy This! Your Listing Has Expired. Now What ?